One of the most popular PvE strategies in Destiny 2 is to have a Hunter play with the Gunslinger subclass, and use a particular piece of armor to deal insane damage with their Super. 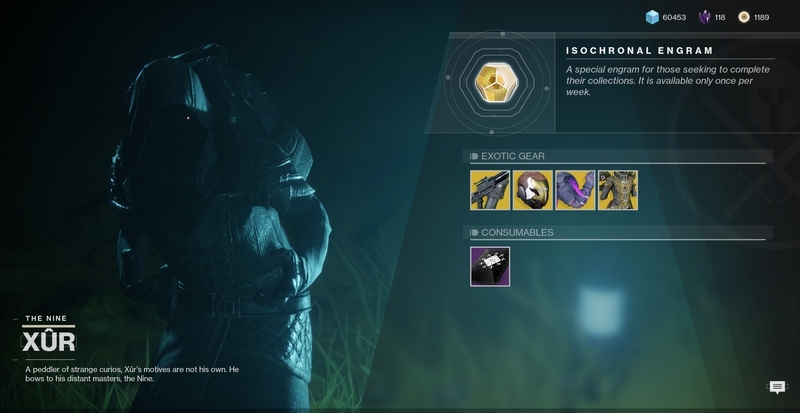 This piece of armor is on sale this weekend, and Xur is the salesman. 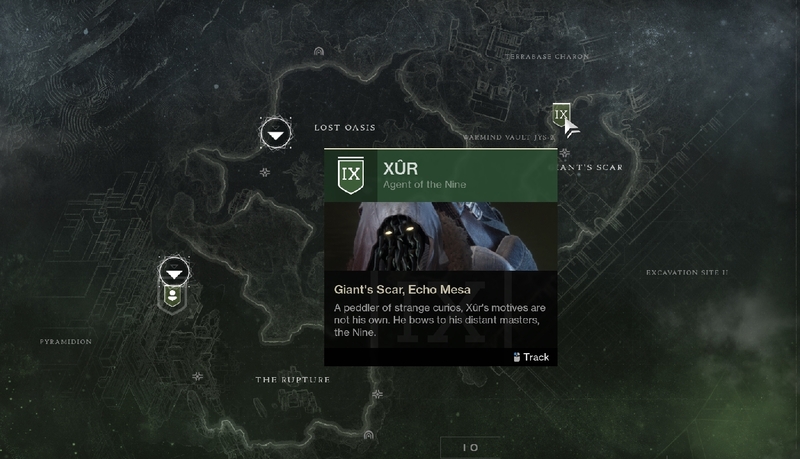 Xur is on Io, in the Giant's Scar section of the map to the east side. He's tucked into a small dark cave, awaiting your Legendary Marks. This week's weapon is Skyburner's Oath, a Cabal scout rifle. This weapon is a slug rifle and it deals more damage when aiming down the sights. It's fully automatic and does extra damage to Cabal while also penetrating Phalanx shields. It costs 29 Legendary Shards. The Hunter armor this week is the Celestial Nighthawk helmet, one of the most useful in the entire game. This helmet's perk is called Hawkeye Hack, and it modifies the Gunslinger's Golden Gun Super to fire a single, high-damage shot. Enemies who are defeated by the single shot explode. This makes the Super especially useful against high-health bosses, and it's being sold for just 23 Legendary Shards. For Titans, this week's armor is Doom Fang Pauldron. They are Void gauntlets that pair well with the Sentinel subclass as they allow your Shield Bash melee kills to recharge your Shield Throw, and melee ability kills will help recharge the Sentinel Shield super. They cost 23 Legendary Shards. Warlocks get Wings of Sacred Dawn this weekend, a chest piece. This armor pairs with the Dawnblade subclass, as it will allow you to float in midair when you aim down sights with a weapon, and precision hits will extend the float's duration. It's on sale for 23 Legendary Shards. Make sure to pick up Celestial Nighthawk this week and begin dominating in Raids and Strikes.